Most guests spend approximately 3 hours at this attraction. Spend time getting to know the oldest plantation in the region with the Magnolia Plantation and Gardens Tour on your trip to beautiful South Carolina. 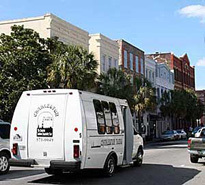 This guided tour begins with transportation from your downtown Charleston area hotel in an air conditioned tour van and takes you to the historic Magnolia Plantation. The Magnolia Plantation built in 1676 is located on a large, gorgeously landscaped estate on the scenic Ashley River. You can tour the mansion, learn more about its rich history while admiring centuries-old heirlooms and antiques. Your tour includes a visit to the on-site petting zoo coupled with a 45 minute tram ride across the 50 acre estate, giving you a chance to learn more about the agricultural aspects of the plantation and view the native wildlife like miniature horses, peacocks, ducks, and geese. The tour also gives you the chance to see a Barbados tropical garden, antebellum cabins, an Indian burial mound, an art gallery, historic graveyard, and a restored slave cabin. The Magnolia Plantation and Gardens Tour is truly a great way to learn more about the incredible past of this fascinating plantation. Reserve your space on the tour today. Add to your Magnolia Plantation experience with the Charleston City Tour, which covers many historic landmarks of Charleston such as the Charleston Museum, the College of Charleston, Four Corners of Law and Rainbow Bow. Ride in a climate controlled bus from one attraction to the next.